In Part 1 of this post, we described how AWS CodeBuild, AWS CodeCommit, and HashiCorp Packer can be used to build an Amazon Machine Image (AMI) from the latest version of Amazon Linux. In this post, we show how to use AWS CodePipeline, AWS CloudFormation, and Amazon CloudWatch Events to continuously ship new AMIs. We use Ansible by Red Hat to harden the OS on the AMIs through a well-known set of security controls outlined by the Center for Internet Security in its CIS Amazon Linux Benchmark. You’ll find the source code for this post in our GitHub repo. To follow along, you will need Git and a text editor. 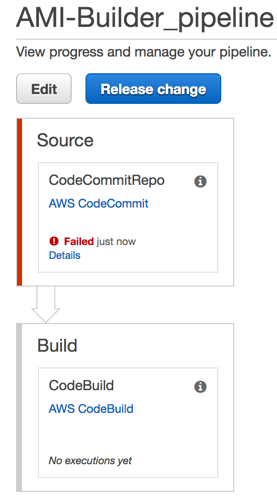 Make sure Git is configured to work with AWS CodeCommit, as described in Part 1. Amazon CloudWatch Events enables you to react selectively to events in the cloud and in your applications. Specifically, you can create CloudWatch Events rules that match event patterns, and take actions in response to those patterns. AWS CodePipeline is a continuous integration and continuous delivery service for fast and reliable application and infrastructure updates. AWS CodePipeline builds, tests, and deploys your code every time there is a code change, based on release process models you define. Amazon SNS is a fast, flexible, fully managed push notification service that lets you send individual messages or to fan out messages to large numbers of recipients. Amazon SNS makes it simple and cost-effective to send push notifications to mobile device users or email recipients. The service can even send messages to other distributed services. Ansible is a simple IT automation system that handles configuration management, application deployment, cloud provisioning, ad-hoc task-execution, and multinode orchestration. 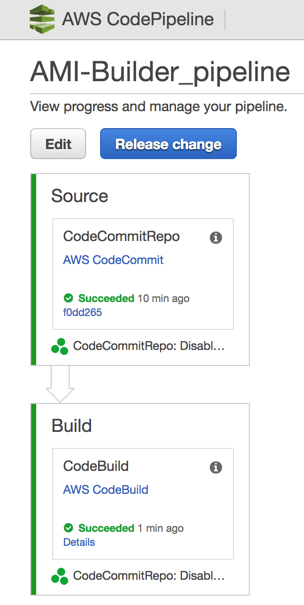 AWS CodeCommit repository Git repository where the AMI builder code is stored. S3 bucket Build artifact repository used by AWS CodePipeline and AWS CodeBuild. AWS CodeBuild project Executes the AWS CodeBuild instructions contained in the build specification file. AWS CodePipeline pipeline Orchestrates the AMI build process, triggered by new changes in the AWS CodeCommit repository. SNS topic Notifies subscribed email addresses when an AMI build is complete. CloudWatch Events rule Defines how the AMI builder should send a custom event to notify an SNS topic. Next, we will clone the newly created AWS CodeCommit repository. If this is your first time connecting to a AWS CodeCommit repository, please see instructions in our documentation on Setup steps for HTTPS Connections to AWS CodeCommit Repositories. From the AWS Management Console, open the AWS CloudFormation console. Choose the AMI-Builder-Blogpost stack, and then choose Output. Make a note of the Git repository URL. Use git to clone the repository. Now that our infrastructure is ready, download all the files and templates required to build the AMI. Extract and copy the contents to the Git repo. git commit -m "My first AMI"
Look up the AMI ID created by Packer and save its findings to a temporary file (ami_id.txt). Forcefully make AWS CodeBuild to fail if the AMI ID (ami_id.txt) is not found. This is required because Packer doesn’t fail if something goes wrong during the AMI creation process. We have to tell AWS CodeBuild to stop by informing it that an error occurred. If an AMI ID is found, we update the ami_builder_event.json file and then notify CloudWatch Events that the AMI creation process is complete. CloudWatch Events publishes a message to an SNS topic. Anyone subscribed to the topic will be notified in email that an AMI has been created. Lastly, the new artifacts phase instructs AWS CodeBuild to upload files built during the build process (ami_builder_event.json and build.log) to the S3 bucket specified in the Outputs section of the CloudFormation template. These artifacts can then be used as an input artifact in any later stage in AWS CodePipeline. For information about customizing the artifacts sequence of the buildspec.yml, see the Build Specification Reference for AWS CodeBuild. CloudWatch Events allow you to extend the AMI builder to not only send email after the AMI has been created, but to hook up any of the supported targets to react to the AMI builder event. This event publication means you can decouple from Packer actions you might take after AMI completion and plug in other actions, as you see fit. For more information about targets in CloudWatch Events, see the CloudWatch Events API Reference. In this case, CloudWatch Events should receive the following event, match it with a rule we created through CloudFormation, and publish a message to SNS so that you can receive an email. In addition to the build specification file, there are differences between the current version of the HashiCorp Packer template (packer_cis.json) and the one used in Part 1.
ami_name: Prefixes a name used by Packer to tag resources during the Builders sequence. vpc and subnet: Environment variables defined by the CloudFormation stack parameters. We no longer assume a default VPC is present and instead use the VPC and subnet specified in the CloudFormation parameters. CloudFormation configures the AWS CodeBuild project to use these values as environment variables. They are made available throughout the build process. That allows for more flexibility should you need to change which VPC and subnet will be used by Packer to launch temporary resources. We now have new properties (*_tag) and a new function (clean_ami_name) and launch temporary resources in a VPC and subnet specified in the environment variables. AMI names can only contain a certain set of ASCII characters. If the input in project deviates from the expected characters (for example, includes whitespace or slashes), Packer’s clean_ami_name function will fix it. For more information, see functions on the HashiCorp Packer website. "rm .ssh/authorized_keys ; sudo rm /root/.ssh/authorized_keys"
We used shell provisioner to apply OS patches in Part 1. Now, we use shell to install Ansible on the target machine and ansible-local to import, install, and execute Ansible roles to make our target machine conform to our standards. Packer uses shell to remove temporary keys before it creates an AMI from the target and temporary EC2 instance. Ansible provides OS patching through a custom Common role that can be easily customized for other tasks. CIS Benchmark and Cloudwatch Logs are implemented through two Ansible third-party roles that are defined in ansible/requirements.yaml as seen in the Packer template. The Ansible provisioner uses Ansible Galaxy to download these roles onto the target machine and execute them as instructed by ansible/playbook.yaml. For information about how these components are organized, see the Playbook Roles and Include Statements in the Ansible documentation. Both third-party Ansible roles can be easily configured through variables (vars). We use Ansible playbook variables to exclude CIS controls that don’t apply to our case and to instruct the CloudWatch Logs agent to stream the /var/log/messages log file to CloudWatch Logs. If you need to add more OS or application logs, you can easily duplicate the playbook and make changes. The CloudWatch Logs agent will ship configured log messages to CloudWatch Logs. For more information about parameters you can use to further customize third-party roles, download Ansible roles for the Cloudwatch Logs Agent and CIS Amazon Linux from the Galaxy website. Now that Ansible and CloudWatch Events are configured as a part of the build process, commiting any changes to the AWS CodeComit Git Repository will triger a new AMI build process that can be followed through the AWS CodePipeline console. When the build is complete, an email will be sent to the email address you provided as a part of the CloudFormation stack deployment. The email serves as notification that an AMI has been built and is ready for use. We used AWS CodeCommit, AWS CodePipeline, AWS CodeBuild, Packer, and Ansible to build a pipeline that continuously builds new, hardened CIS AMIs. We used Amazon SNS so that email addresses subscribed to a SNS topic are notified upon completion of the AMI build. By treating our AMI creation process as code, we can iterate and track changes over time. In this way, it’s no different from a software development workflow. With that in mind, software patches, OS configuration, and logs that need to be shipped to a central location are only a git commit away. Hook up a Lambda function in Cloudwatch Events to update EC2 Auto Scaling configuration upon completion of the AMI build. Use AWS CodePipeline parallel steps to build multiple Packer images. Add a commit ID as a tag for the AMI you created. Create a scheduled Lambda function through Cloudwatch Events to clean up old AMIs based on timestamp (name or additional tag). Implement Windows support for the AMI builder. Create a cross-account or cross-region AMI build. Cloudwatch Events allow the AMI builder to decouple AMI configuration and creation so that you can easily add your own logic using targets (AWS Lambda, Amazon SQS, Amazon SNS) to add events or recycle EC2 instances with the new AMI. If you have questions or other feedback, feel free to leave it in the comments or contribute to the AMI Builder repo on GitHub.